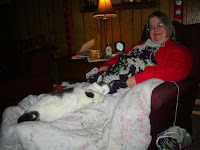 CATERWAULING: What's on the needles . . . and what's off! I'm working on several things at the moment, and I'm about to start another! LOL I have a short attention sp . . . . oooh, look! Something shiny! Anyway, I thought it was high time I gave you all a gander of the yarny goodness that has been keeping my fingers happy . . .
First the done ones . 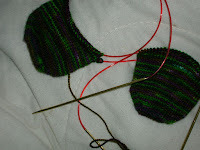 . . these are slippers I made out of 2 strands of Lamb's Pride Worsted Weight on #10 needles. I love them, and I think I'll make more! They're probably from the same pattern my Grandma used when we were kids. I love nostalgia, and I love warm feet! I think I'm using slightly better quality yarn, though, because I recall the ones she made making the bottoms of my feet feel like the skin was peeling off or something. 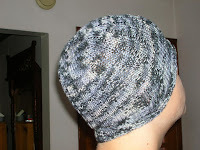 This is a black and grey chemo hat for a guy I went to college with. He's a cool musician, now, so I figure the colorway would be perfect. This is from Panda Silk (silk, bamboo mix) and it's delightfully soft. I think silk yarn is perfect for chemo caps . . . especially since my pal, Julie, told me so. I really wish my friends would stop getting the big C, but I'm glad that I can do this small thing for them. These are neck scarves. It's an absolutely perfect pattern for luxurious yarn - easy to do w/o a lot of thinking, uses about one skein (more for me because I'm an ample Woman, and like ample scarves). This is silk/wool blend and I fell in love with the first one so deeply that I had to make another. I might go back to the Merc againand buy yet another color someday soon. Just see if I don't! I wore the pinky one today with a navy blue dress. Looked great! 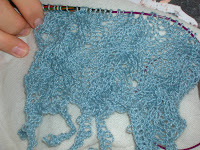 This is a lovely lacey sampler scarf I'm making with leftovers from the shawl I made Mom for Xmas. 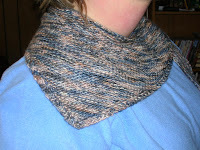 It's alpaca/silk blend, very fine lace-weight yarn. I found the pattern in a book and actually BOUGHT the book . . . more of a pamphlet, really. Usually I just get books from The L.
This pic shows the blanket I started crocheting last . . . umm . . . Spring, maybe? I still haven't gotten very far on it, but I wanted to show you that I really AM still working on it now and then. It's out of really horrid acrylic yarn, but that's what the donation places prefer with blankets, so acrylic they'll get! I learned to crochet after seeing a friend whip up an entire baby blanket in about 2 hours. How does she DO that??? Trust me, this is no 2-hour blanket! These are the toes of the socks I'm making. The yarn is lovely merino, tightly spun and very smooth. It's purples and greens, and it's really nice. I knit on these when I don't have anything else mindless to work on. 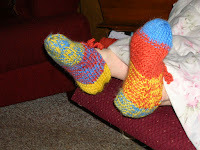 I'm doing 2 at a time, toe-up with the Evil Sock Genius' pattern, on 2 circs, size 1. And yes, I know what you're thinking - that is a freakin thin needle! I also still have a sweater on the needles that will eventually be fore my long-suffering DH. Poor thing might need to wait a while because I STILL don't really feel like tackling it again. I've frogged (ripped out) the sweater I made for myself a year or two ago. 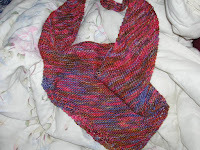 It never fit right, I never wore it, but I still love the yarn. I'm finally blocking the kinks out of that yarn so I can make myself another sweater with it. I think that's my complete knitting update. I am learning so much from you knitters. I really had no idea there were so many types of yarn, or how $$expensive$$ it can be. Your projects look lovely; I'm sure all of your lucky recipients feel loved. Yea, it can be a little pricey, but to be honest, it does so much for my mental health that even DH thinks it is more than worth it!